In a historic victory for worker and consumer safety, the FAA Reauthorization Bill passed the Senate overwhelmingly on Wednesday by a vote of 93-6 with the inclusion of critical provisions that protect passenger service agents from assault and increase to 10 hours the minimum rest for Flight Attendants. For more than a decade, CWA passenger service agents have been fighting to strengthen protections against passenger assaults. Their personal stories and recommendations as they presented them to Congress and officials at the Department of Transportation, FAA, and Transportation Security Administration shaped the provisions included in the final legislation. "CWA's passenger service agents shared their personal stories of assaults by passengers and how this impacted their safety and that of their colleagues," said Richard Honeycutt, Vice President of CWA District 3 and Chair of CWA's Passenger Service Airline Council. "Members of Congress took to heart their experience and recommendations as they shaped the final language in the bill. Addressing this issue in the FAA Reauthorization bill was long overdue." The FAA Reauthorization bill also included a major win for consumers and Flight Attendants who are on the frontline as first responders in emergency situations in flight. The inclusion of an increase of the minimum rest time from eight to ten hours for Flight Attendants has been the top safety priority for AFA-CWA's 50,000 Flight Attendants. This change brings the Flight Attendant rest time into alignment with the minimum rest time for their flight deck counterparts. "The inclusion of the increased rest time for Flight Attendants closes a safety loophole," said Sara Nelson, AFA-CWA International President. "Congressional fatigue studies have confirmed this was a safety and health issue, but this also is about equality. Our largely female dominated profession now has parity with pilots in our minimum rest period." CWA members in the Midwest and at AT&T Legacy T continue to mobilize for a fair contract that keeps good jobs in their communities. Watch and share this emotional new video that shows just what they are fighting for. The CWA bargaining team representing Windstream workers in Pennsylvania reached an agreement with the company to extend the current contract until Friday, November 9. Bargaining is scheduled to resume Monday, November 5. The CWA bargaining team urged members to use the time between now and then to mobilize and send the message to Windstream that nothing less than a fair contract is acceptable. Members of The NewsGuild of New York-CWA working at S&P Global, a financial information and analytics company, ratified a new five-year agreement which includes wage increases and additional job security language that affords career opportunities for workers. "I'm proud of the contract we achieved," said Sandi Henson, the Guild Unit Chair. "We came to the table with proposals that represented what we need to be successful and what we want in order to feel valued and heard. We now have processes and a strong contract in place that allow just that." 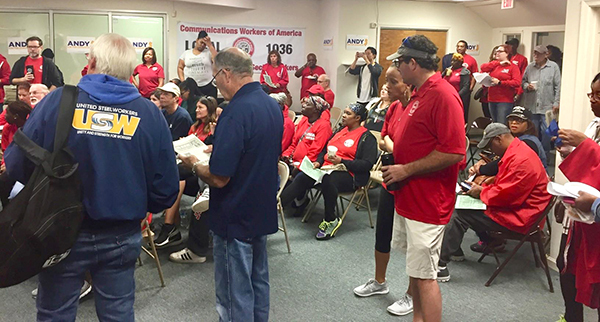 Negotiations are now underway for a first contract between NABET-CWA's bargaining committee and AT&T/DIRECTV for employees at the DIRECTV Sports Broadcast Center in Los Angeles. During the first round of talks in San Ramon, Calif., last week, the NABET-CWA bargaining committee presented a proposal package designed to increase compensation and wages, stabilize benefits, and improve working conditions including overall scheduling procedures, break and meal period planning, work assignment modifications, limitation on operators being assigned to more than one work station at a time, and more. The next round of negotiations is scheduled for October 8-10. The Trump Administration reached a deal with Mexico and Canada on an updated NAFTA agreement on Sunday night. Unfortunately, nothing is included in the deal to advance the provisions of CWA's call center bill, despite CWA President Chris Shelton asking the Administration multiple times to take action to stop the outsourcing and offshoring of call center jobs. While the new agreement contains improvements in certain areas, significant changes are still needed to make this a good deal that benefits workers and stops the race to the bottom. The labor rights standards are improved, but the process to enforce those labor rights uses the same failed process from the past; the harmful ISDS, the private justice system for multinational corporations, is narrowed but still included in the deal; environmental issues including climate change are not addressed; and the agreement gives pharmaceutical companies more protection against lower-cost generic drugs than either the current NAFTA or the failed TPP. President Shelton vowed to continue to work with U.S. Trade Representative Robert Lighthizer and members of Congress to address these concerns and ensure that the final agreement puts working people first. Read President Shelton's statement here. 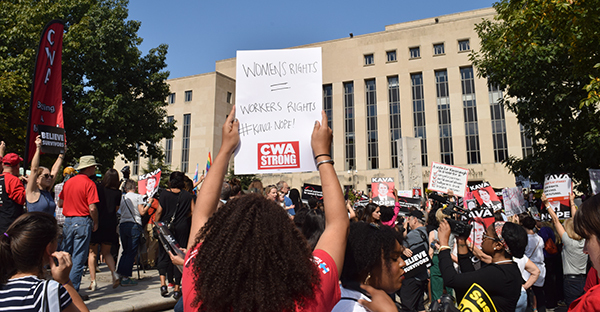 CWAers joined thousands in a mass mobilization on Thursday to stop the confirmation of Judge Brett Kavanaugh to the Supreme Court. CWA members traveled from New Jersey and elsewhere to take part in the rally at the Supreme Court in Washington, D.C.
Kavanaugh has a long record of ruling against workers and their families and regularly siding with employers against employees seeking justice in the workplace – including CWA members. The Senate is expected to move quickly this week to try to vote to confirm him. "Kavanaugh is unfit to serve in a lifetime position on the Supreme Court," said CWA Secretary-Treasurer Sara Steffens. "Not only is Kavanaugh facing several credible accusations of sexual assault and has lied to the U.S. Senate, but he is also unqualified to serve as a Supreme Court Justice with his track record of being in the pocket of corporate special interests and his total disregard for workers, consumers, women, and fundamental civil rights. The U.S. Senate must reject Kavanaugh’s nomination." 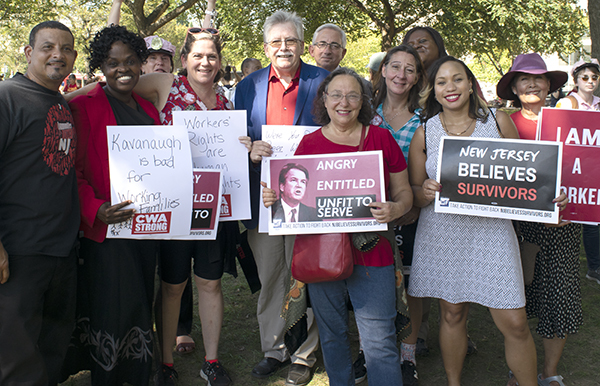 CWAers joined thousands in a mass mobilization on Thursday to stop the confirmation of Judge Brett Kavanaugh to the Supreme Court, including members who traveled from New Jersey (below) to participate. 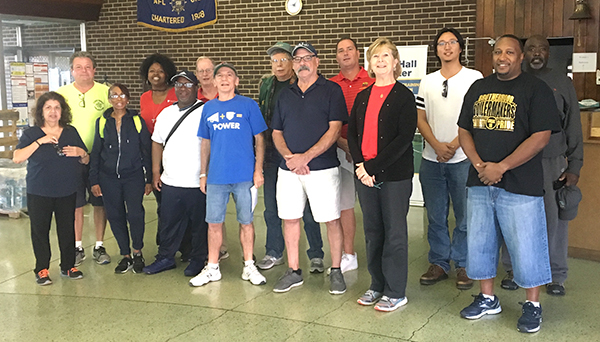 More than 100 CWA members knocked on the doors of union households in New Jersey's 3rd Congressional District to encourage union members to vote for Democratic challenger Andy Kim, who is taking on incumbent Republican Tom MacArthur. McArthur has made it his mission to try to eliminate coverage for preexisting conditions and allow higher premiums for older Americans, as well as voting for Trump's corporate tax cut bill, which provided huge tax breaks to the wealthiest Americans. Across Pennsylvania, CWA members have been hitting worksites and doors, talking to their fellow union members about the importance of getting out the labor vote for the November 6 election. "Pennsylvania's Congressional delegation is about to change," said CWA District 2-13 Vice President Ed Mooney. "After the redistricting, we have the chance to go from embarrassing to a group of representatives that support and advocate for labor rights." On Saturday, Mooney and union members knocked on doors to get fellow members informed and involved in the election. Across Pennsylvania, CWA members have been hitting worksites and doors talking to their fellow union members about the importance of getting out the labor vote for the November 6 election. 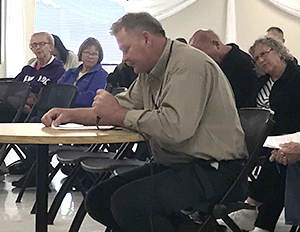 CWA Local 7270 President Mark Doffing spoke at a Minnesota Public Utilities Commission hearing on service concerns at Frontier Communications, highlighting how Frontier has left the community behind through a lack of investment in their local workforce. CWA Local 7270 President Mark Doffing spoke at a Minnesota Public Utilities Commission hearing on service concerns at Frontier Communications. More than 100 CWA members work at Frontier as technicians and in call centers in the southern Minnesota area. During his testimony, Doffing highlighted how Frontier has left the community behind through a lack of investment in their local workforce. "Our members are on the frontline working with customers every day," said Doffing. "They see the problems that customers experience first-hand. They have witnessed the changes in business practices and understaffing that are the underlying cause of these problems. Simply put, Frontier has not invested sufficiently in the network in Minnesota and in the level of workforce necessary to provide quality service to Minnesota customers." Doffing also spoke about how customers are experiencing service problems as the result of Frontier eliminating local customer service jobs. "Minnesota residential customers used to be put in contact with a call center here in Minnesota, staffed with CWA-members, who were familiar with the area and the customers. Now calls go into a single, nationwide customer line. Customers are frustrated that they must call repeatedly to get their service or billing issues resolved." Doffing urged the Commission and the Department of Commerce to ensure that Frontier does what is right for customers and Minnesota communities. U.S. Senator Bob Menendez (D-N.J.), a senior member of the Senate Banking Committee, sent a letter to the heads of several banking regulators this week questioning if they are doing enough to incorporate reviews of harmful sales practices into their supervisory oversight policies. He was joined by Senators Sherrod Brown (D-Ohio), Jack Reed (D-R.I.), Elizabeth Warren (D-Mass. ), Chris Van Hollen (D-Md. ), and Catherine Cortez Masto (D-Nev.). In July, bank workers from the Committee for Better Banks, a CWA project, met with staff from many of these Senate offices and testified at a congressional briefing on how frontline bank workers at the country's biggest banks still face high-pressure quotas, low pay, and few opportunities to advocate better for their customers – even two years after the Wells Fargo scandal. "The Wells Fargo fraudulent account scandal shined a light on dangerous industry practices in which banks place punishing, and oftentimes, impossible sales goals on front line employees," the Senators wrote to heads of the Consumer Financial Protection Bureau (CFPB), Office of the Comptroller of the Currency (OCC), Board of Governors of the Federal Reserve System, and the Federal Deposit Insurance Corporation (FDIC). The Senators also expressed concern that the continuation of these questionable practices may result in additional harm to consumers. 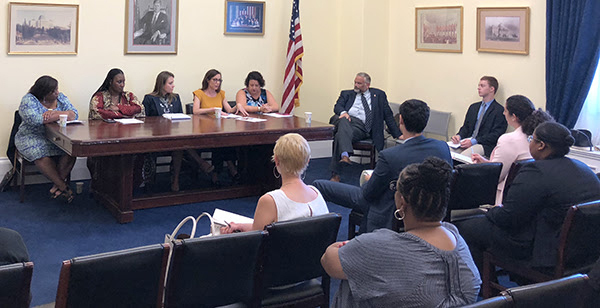 In July, bank workers from the Committee for Better Banks, a CWA project, spoke about their working conditions at a briefing hosted by the Congressional Progressive Caucus. New York and New Jersey airport workers celebrated a huge victory this week in their fight for dignity and economic justice at JFK, LaGuardia, and Newark airports as the Port Authority of New York and New Jersey's Board of Commissioners approved a proposal to raise wages to $19 by 2023 for 40,000 NYC-area baggage handlers, security officers, wheelchair agents, terminal and airplane cleaners, and other airport workers. CWAers stood with the airport workers, joining their actions and submitting two rounds of comments to the Board of Directors of the Port Authority of New York and New Jersey in support of the wage increase. CWA represents more than 500 passenger service workers at LaGuardia and JFK at both American Airlines and Envoy Air.